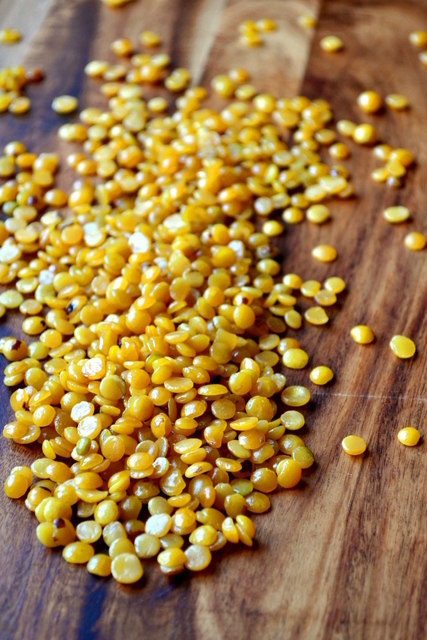 Toor Dal – also known as tuvar and arahar dal – is a variety of yellow split pea widely used across Indian cuisine. Sold either naturally, or “treated” with oil to prolong its shelf life, toor dal makes for a quick and inexpensive meal or accompaniment to curry. This recipe is particularly simple and as long as you have a well-stocked spice cupboard is very easily prepared. 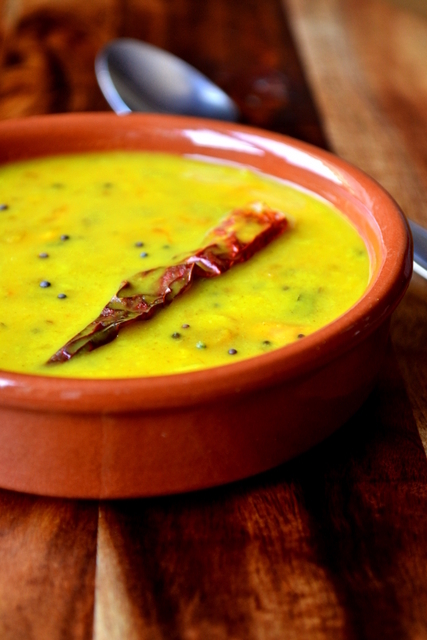 Though mild and nutty, toor dal has a rather distinctive flavour. I’ve found that it generally contributes far more to the flavour of the overall dish than red lentils or even chana dal. 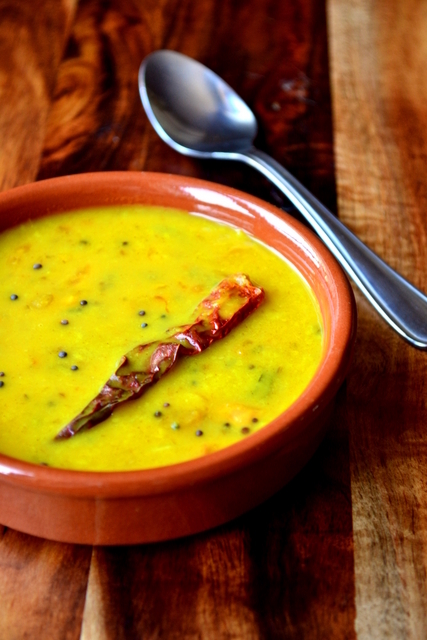 Toor dal is also far more convenient than chana dal as it doesn’t require any soaking at all. Simply rinse, repeat and cook. What could be better? Bring the dal to the boil in a large pan with 1 litre of water – skim off any scum that forms. It should take around 40-45 minutes to break down into a soft-consistency. Once the dal has started to soften, heat the oil in a large frying pan and gently cook the garlic and chillies. After 2-3 minutes add the ground cumin, black mustard seeds and curry leaves. Once completely broken down add the turmeric and asafoetida to the toor dal and mix thoroughly before adding to the garlic and chilli. Finish the dal off with a finely minced tomato and season to taste. Serve with rice and flatbread. Cost: Though not a particularly common ingredient in Britain, toor dal is nonetheless very cheap. It’s difficult to argue against any ingredient sold for £2.40 per kilo. Even with a long list of ingredients, this nutritious Indian recipe should set you back no more than £1.50. Looks great – love any sort of dal but don’t think I’ve actually cooked toor dal yet…time to change that! Give it a go – I love the flavour. Thank you – it was delicious too. god i love your photograhy! it’s simple,clean and inviting. what lense do you use frugal? Thank you, Kathy! I just use a kit lens, believe it or not. I am going to invest though. Do you know what, Veronica? I’d love to! This is my first visit to your blog. I came after reading your interview in Emma’s Cakes, Bakes and Biscuits blog. I have the feeling I will be coming more often, you have some great recipes here – First one I’ll try will be Red pepper and sunflower pesto …. Thanks a lot for sharing all these! Great to see you decided to come over and comment! Glad you like my recipes too – enjoy! Thanks, Maggie – I’m so glad you like my blog. Let me know when you’ve tried a recipe! Thank u for replying. Right , it is 9 am here, and I hv got ready all ingredients I need for 3 dahls. Toor, fragr red and tarka!! I want to compare the tastes!!! I will let u know. I made the tasty Cavalo nero dish last week. Mmmmmm yum. No worries – thanks for your email too! I hope you enjoy all the Indian dishes, they’re some of my favourites! Oops…. Sorry about spelling …… Silly ipad!!! Why did my Toor dali come out rather bitter, I wonder? I rinsed it both before and after cooking (second rinse because of the slight bitterness I noticed when I tasted it). Maybe I should have cooked it longer before adding it to the dish? Thanks for your help. love the mushroom soup. cream cheese was not in the pantry so I used rice and the results was wonderful. I am going through the recipes and enjoying them.